From VioVet comes RestAural, a gentle everyday cleaner for the maintenance of healthy ears. Whether you have a cat or dog, it is important to monitor and maintain your pet’s ears throughout its life, especially if it is predisposed to problems. 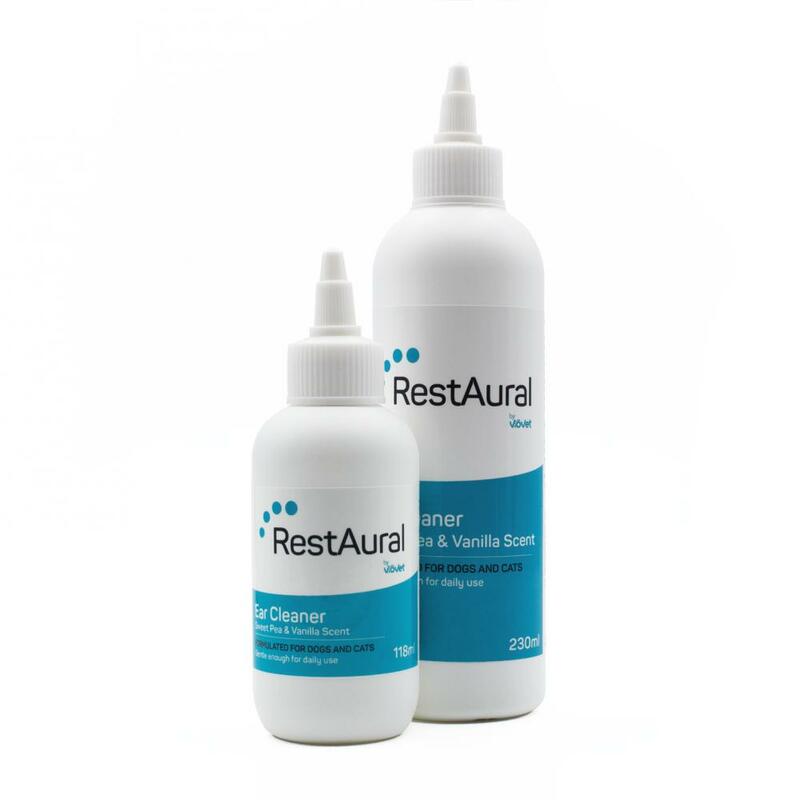 RestAural is specially formulated to gently clean, dry and balance the ear canal, reducing the chance of infection. Containing ceruminolytic agents to remove ear wax and purulent discharge, drying agents to eliminate moisture and prevent bacterial build-up, and acidifiers to balance the ears’ natural pH, RestAural is an effective, all-round cleaner that is suitable for routine use in healthy ears. Ceruminolytic agents – glycerine, propylene glycol, dioctyl-sodium sulfosuccinate – these chemicals work together to remove ear wax and clear the ear canal for improved hearing. They also remove purulent discharge which may result from an abrasion inside the ear. Drying agents – SD alcohol 40, benzyl alcohol – when the ear canal is moist through bathing or swimming, it is the perfect breeding ground for bacteria. Drying agents disperse moisture and aid in its evaporation, leaving the ear passage dry and clear. Acidifying agents – lactic acid, salicylic acid, benzoic acid – acidifying the ear canal changes its pH, making it an unfavourable environment for bacterial growth. In infected ears, these acids can cause irritation, so it is important to only use the cleanser in healthy ears. For topical use only. Do not use in infected or irritated ears. Below are some recent questions we've received regarding RestAural™ Ear Cleaner for Dogs & Cats, including answers from our team. Hi Viovet. How often can I use RestAural on my dogs ears, plus how many drops do I use in each ear? Many thanks. 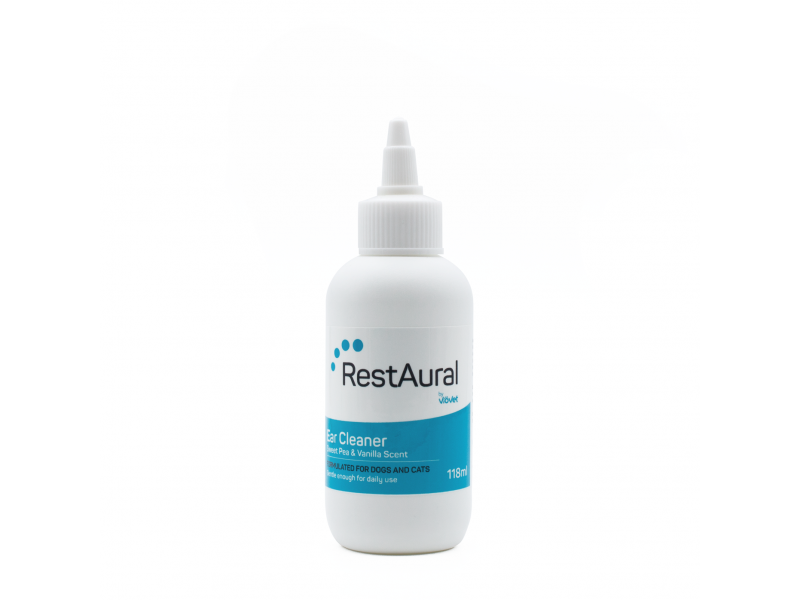 RestAural™ is gentle enough to be used daily if required, the amount that you'll need will depend on the size of your dog's ears, I'd recommend starting with a few drops and massaging the base of the ear before giving it a wipe out to see if this is enough to remove the debris, going back with more drops if needed. Any excess cleaner will make its way out of the ear canal when they shake their head. I have a 5 month old springer can I use this on her? Yes, RestAural can be used on puppies & juniors also. It would be ideal for regular cleaning, especially for a breed with droopy ears, as they're more prone to ear problems due to the extra hair and reduced air flow. Are these ok to use after ear infection treatment? My yorkie is currently being treated for ear infection at vets with weekly ear drops. Once cleared would ghis be good to keep ears clear? Also what's your opinion on plucking internal ear hair my vet recommends it but my sisters vets say the hair helps keep the ear canal clean. Ferrets are very prone to get dirty ears and are very likkle and hard to clean... I was wondering if RestAural ear cleaner is safe enough to use in my Business of Ferrets ears? Many thanks Ferretcrazyann!!! RestAural is safe to use for on ferrets. You would still have the practical difficulty of applying it while they wriggle about. I wonder why the ears need cleaning. Do your ferrets have ear mites? There must be something which is making them dirty as many ferrets have perfectly clean ears for years with no treatment. If there are ear mites, then a specific treatment based on ivermectin could be your best bet. All your pets should be treated once a week for 3 doses. The Xeno products could be suitable, but ideally check with your vet first. My dog is particularly averse to having her ears treated in any way. How is this product applied and is there an easy way of making it acceptable to a dog that is adept at spotting what's coming and refusing to co-operate? Some dogs can become seriously phobic about having anything added to their ears. I think that it can make things worse by trying to "sneak" something in without them realising, because they do in the end and it makes them more suspicious. If you are able to force the issue and the dog will give in, then if you are very gentle and reward the dog afterwards, then most dogs will learn to accept it and get better about it in time. If not, then you will need your vet to help and it is either done at the vets, or maybe you are given a sedative etc to help. Whatever the case, you would need some help from your vet. As far as putting the product into the ears, it is better if it goes in at body temperature (not cold or hot). Other than that I think being open and authoritative, firm but kind, is the best way. It just has to be gently allowed to flow into the ear, then gently massaged in. Some people have to put a muzzle on their dog to treat the ears, but it can become a routine which works well and always ends happily with a reward. Most people should probably not try at all if they are not confident of "winning" and seek help from their vet. Most dogs will allow this without much fuss, but some can become so fearful that even their vet cannot do it in a conscious dog. I have very sensitive skin.Is this the best ear cleaner for dogs with atopy? This product should be fine for a dog with atopy. Having said that, if the atopy is very bad then the skin can react to pretty much anything other than normal saline (dilute salt water). RestAural should be a good product for your dog and I would happily recommend it. Having dirty ears with excessive wax, discharge or any microbial overgrowth is likely to be more of a concern and this product is usually very good in those circumstances. If the ears are inflamed and sore but perfectly clean, then this might not be as good as drops containing a steroid. They would have to be prescribed by your vet. Berriewood Wholesale has been working alongside VioVet to bring you a wider range of products, including prescription medications. Berriewood Wholesale has been owned and run by VioVet since 2015, and has been operating since then from the same premises in Luton, Bedfordshire. Berriewood Wholesale has now been fully merged with VioVet. If you had an account with Berriewood Wholesale you can securely login with your same details on the VioVet website and there will be no delay or disruption to the supply of your pet products. Thank you for being a Berriewood Wholesale customer, we are confident that you will be just as satisfied with what VioVet can offer you and your pets!